The year’s own darling and the Summer’s Queen! Lustrous as the new-throned crescent moon. 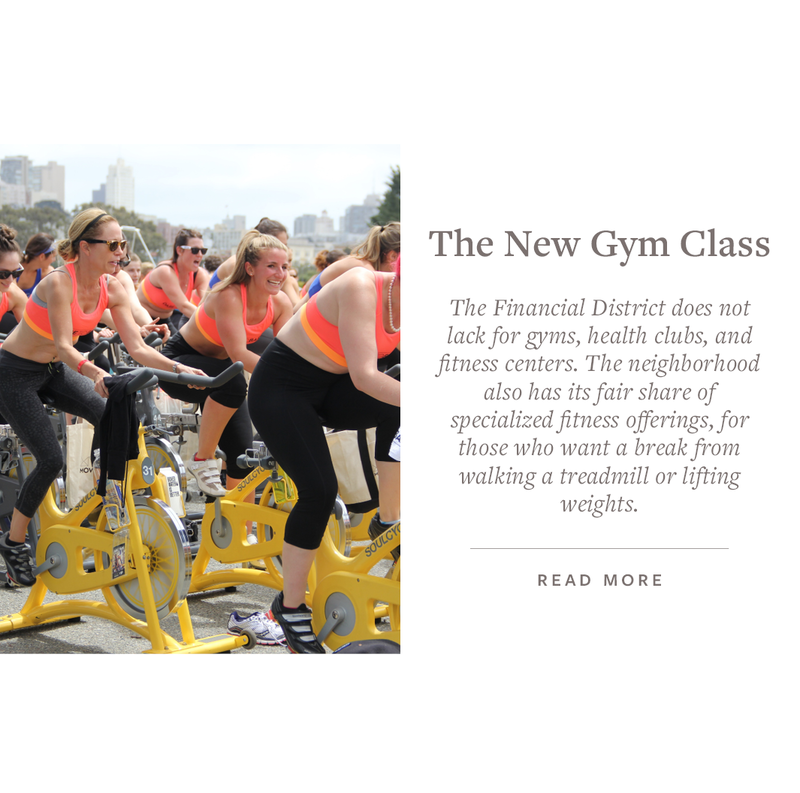 This month’s Culturally Inclined focuses on the “Financial District” (also referred to as FIDI), exploring its restaurants, River to River festival, Westfield Trade Center and Brookfield Place, parks, art, history, fitness, market report and much more! 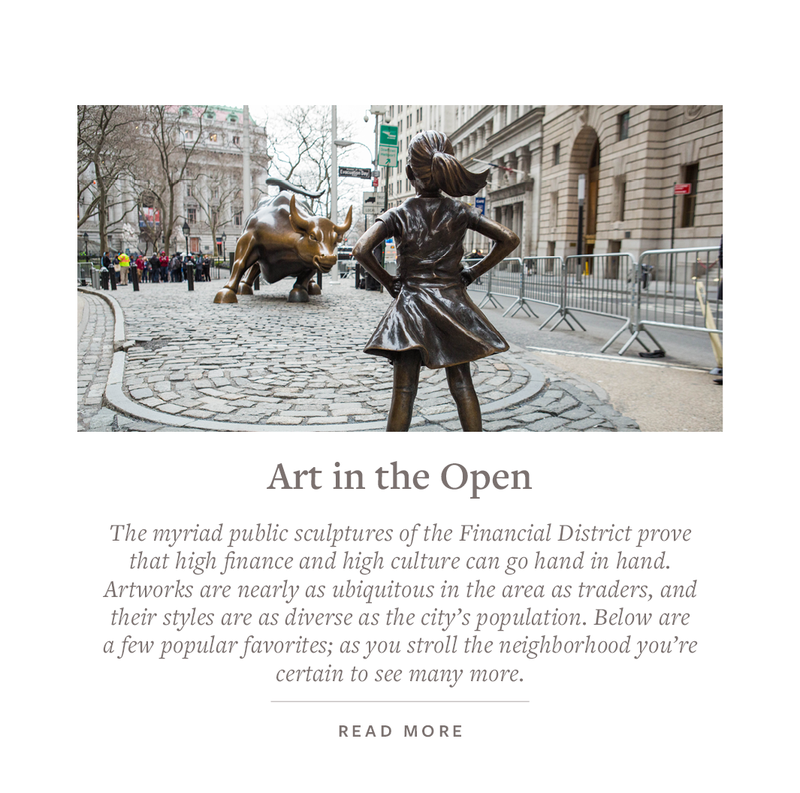 FIDI located at the southern tip of the Island where New York City’s roots began in the 1600’s with its first settlements and trade-monopolies. As you weave through the charming narrow, canyon-like streets you will find colonial buildings sandwiched between skyscrapers. 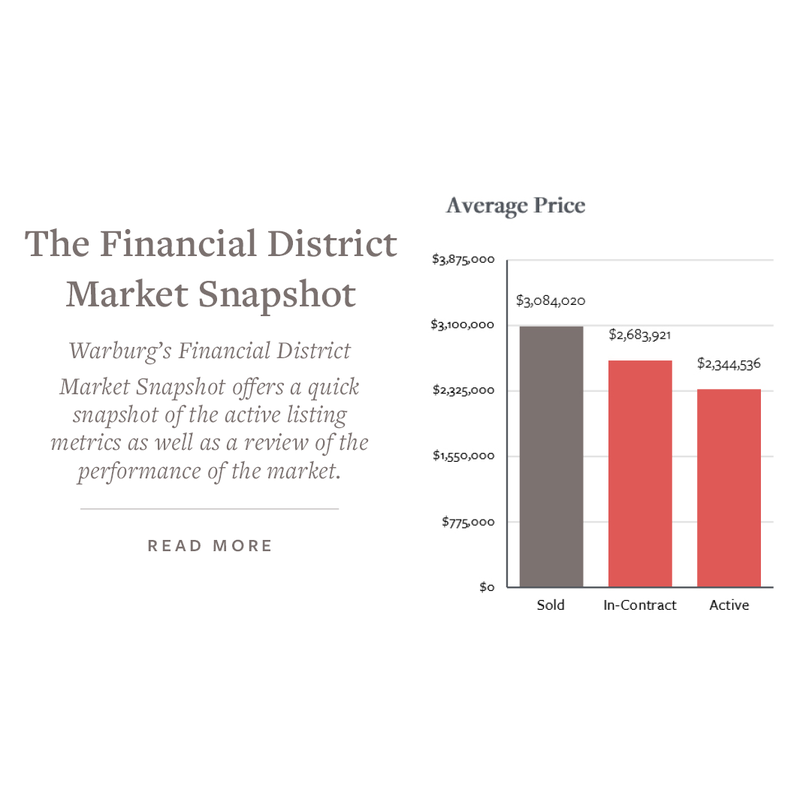 FIDI encompasses the area south of City Hall Park in lower Manhattan, but excludes Battery Park and Battery Park City. And, the street names all reference a piece of history, such as: “Beaver” one of the oldest street commemorates the paddle-tailed, dam-building, aquatic rodent whose fashionable wool pelts made up the chief avenue of commerce between the Dutch settlers, “Pearl” for the abundant oysters found in the river, where the first city’s first City Hall resided and Thomas Edison’s first power plant starting electricity in the Country, “Stone” New York’s oldest street originally Hoogh Straet (High Street) and the location of the first commercial brewery in America. 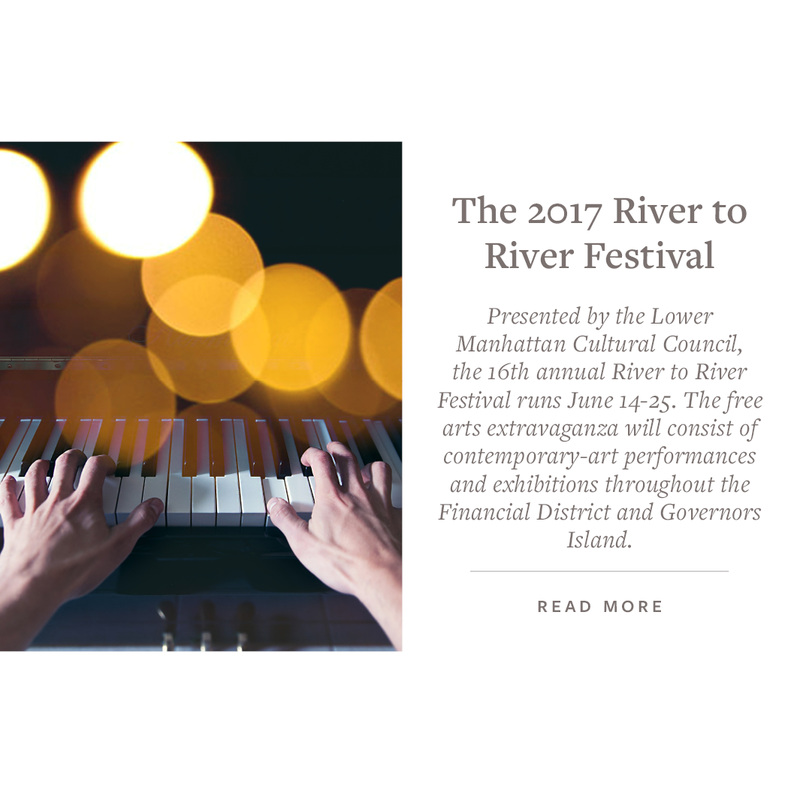 Now, the Street is a historic district and destination spot for dining and entertainment. 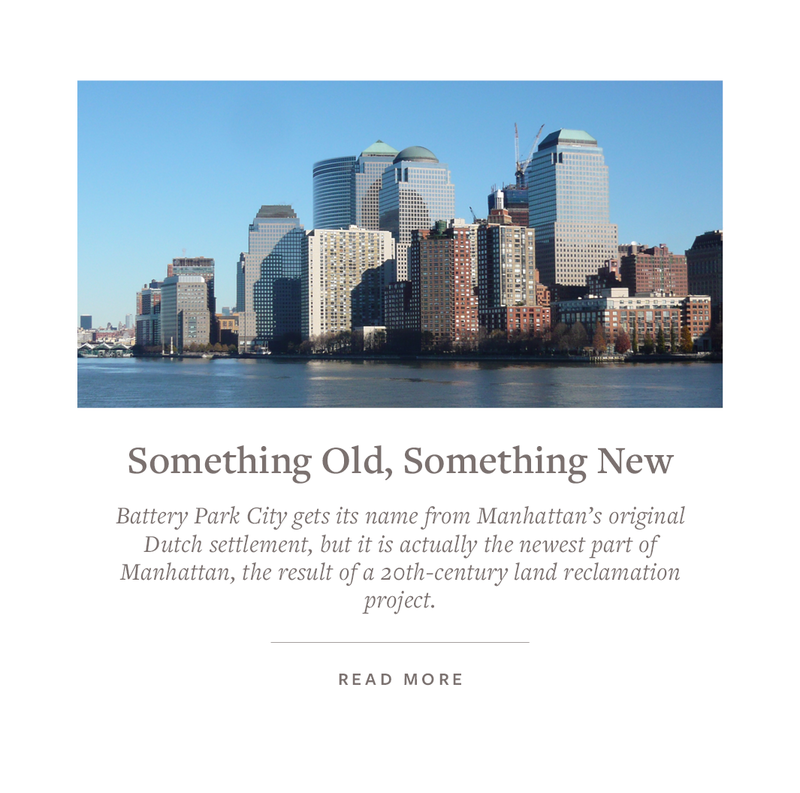 I had spent many years working in the Financial District and have witnessed a fragment of the areas rich history of destruction and renewal. My first stint was working for Merrill Lynch in their headquarters on 250 Vesey formerly 4 WTC part of the now Brookfield Place Complex, on the Trading Floor stretching out the size of a football field a buzz with titans screaming market news in the haze of flashing green lit monitors. In this brand-new building, I had the opportunity to peer out of one of the windows and watch in anticipation the Winter Garden Atrium designed by architect Cesar Pelli, a 10-story glass-vaulted pavilion. When I left for the evening I would see a large empty lot that today is dotted with residential buildings, hotels and restaurants like Shake Shack. At that time Pier 17 on the East River was just built in the South Street Seaport area where people would meet and mingle on Thursday and Friday evenings. That trend ended and soon everyone began congregating for cocktails and food on the Hudson Waterfront off of Vesey Street. Now it is a wonderful location to listen to concerts, shop, dine at new restaurants, and enjoy the sail boats racing or admire the world class yachts. As a mortgage-backed securities ratings analyst at S&P, I spent many years at 55 Water Street, one of the largest office buildings in New York City designed by Emory Roth & Sons and is a 3.5 million square foot structure with 53 stories. My desk overlooked the harbor and viewed the ferries shuttling back and forth commuters and tourists from Staten Island, New Jersey, Brooklyn, Queens and Governors Island. As forewarned by the military swat team and secret service surrounding the area on occasion, I would see from my 40th floor perch, the President of the U.S. and the landing of Air Force 1. The building is also site of the Vietnam Veterans Plaza, also known as the New York Vietnam Veterans Memorial, home to two well-known Peregrine Falcons Jack and Diane who have produced 19 children, and the Elevated Acre. On warm summer days I would lunch on the Elevated Acre and watch the commuter helicopters jet off like swarming bees to the Hamptons. The Elevated Acre is a great place to picnic with the family or watch one of the summer movies or concerts. 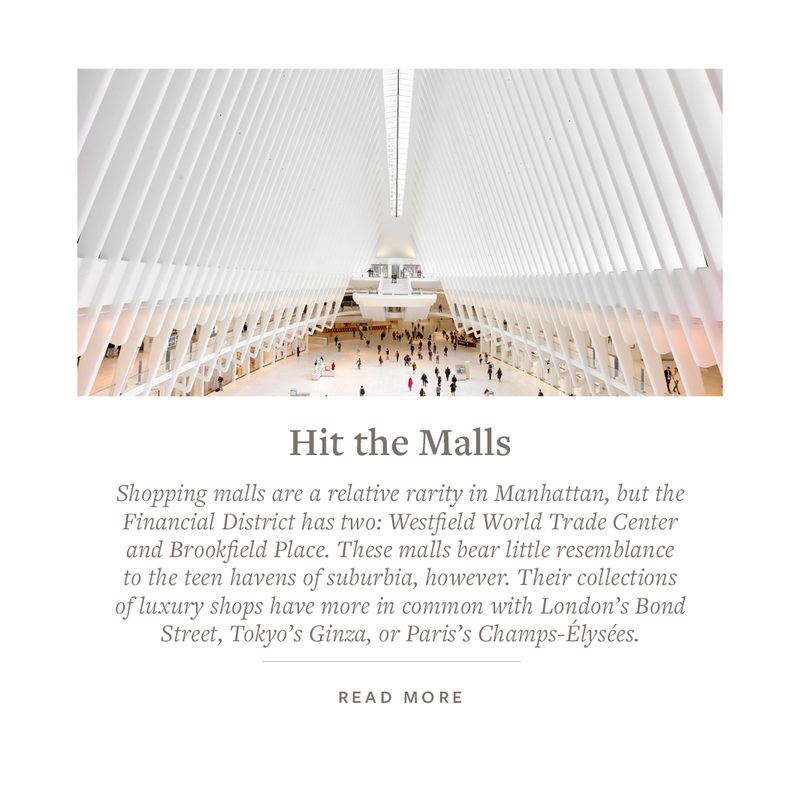 The area today houses some great economic powerhouses, including the headquarters of major banks, the New York Stock Exchange, in addition to the World Financial Centers and WTC Transportation Hub – The Oculus designed by Santiago Calatrava’s. 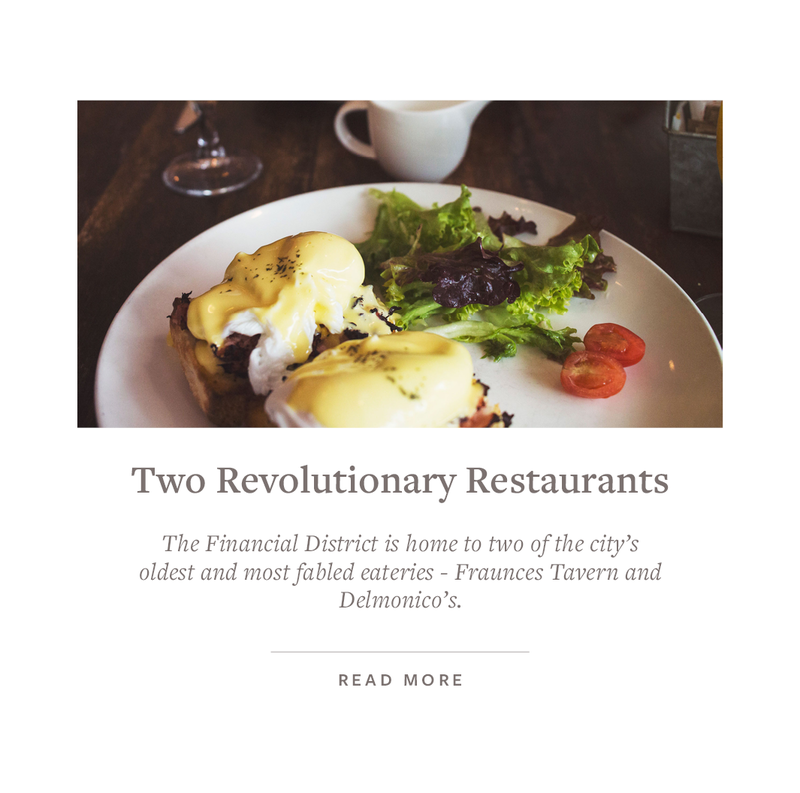 Some of the numerous other attractions include Fraunces Tavern, where George Washington bid farewell to his troops (also, they have a museum! 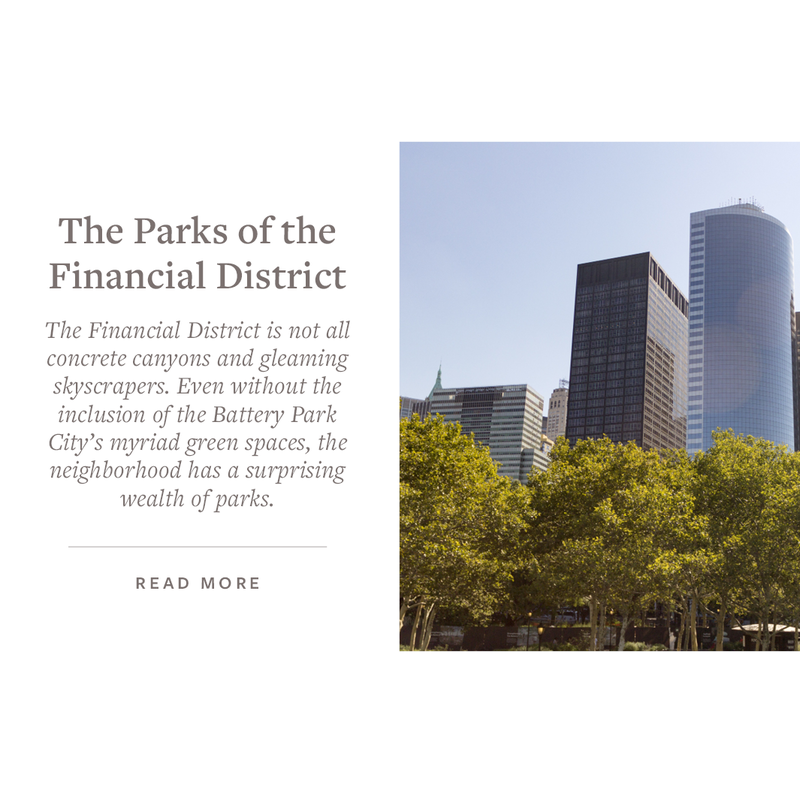 ); the newly-landscaped City Hall Park; the Museum of the American Indian and the US Custom House at Bowling Green; Trinity Church, the first parish church in New York City and the resting place of Alexander Hamilton and Robert Fulton, among others; War Of 1812 strong hold Castle Clinton; the Staten Island-bound South Ferry; and the Federal Reserve Bank. There are plans to convert the former New York Stock Exchange building at 20 Broad Street into apartments, ground has been broken for a Performing Art Center, Alamo Drafthouse may open its third NYC theater to the landmarked office tower 28 Liberty Street, 45 Park Place – “50 condos whose interiors designed by Piero Lissoni and are divided throughout the tower by type-loft residences, tower residences, and duplex penthouses – that grow in size higher up the tower”, 49 Chambers – a onetime home of the Emigrant Industrial Savings Bank is in the midst of restoring and transforming into a 99-unit condo building, the iconic Woolworth Building designed by Cass Gilbert is having its top thirty floors transfored by famed French architect Thierry W Despont, luxury condominium residences, new luxury 52 condo residences at 101 Wall Street designed by internationally celebrated Dutch designer Piet Boon and its fascade of glazed brick and bronze hearkens back to its Art Deco past, 70 Pine Street Art Deco building is being converted to 600 rental units, One Seaport, 60 story condominiums, developed by Fortis Property Group, 30 Park Place – Four Season Hotel by Larry Silverstein and Robert A.M. Stern, The Beekman, a condo/hotel occupies a landmark Queen Anne building from 1881, the height of New York’s early Gilded Age. Then known as Temple Court, 45 Broad Street plans to develop a 206 unit residential tower, 50 West191 condo units, Helmut Jahn’s 7,800 foot West Street tower, 42 Trinity Place, 1 Wall Street, 112-118 Fulton Street, 102 John Street, 75 Nassau Street and there are plans for many others to rise up to join New York City’s majestic skyline. 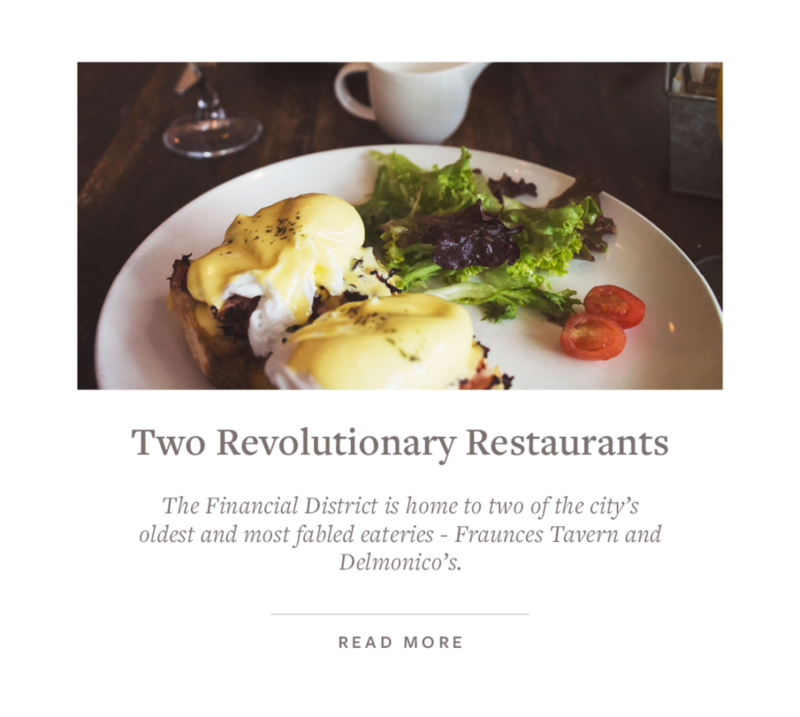 The massive rebuilding efforts in the WTC and Seaport sections are creating a dining scene shift to FIDI. Some restaurants/bars that are on the horizon and favorites: Nobu on 195 Broadway (Fulton Street), Eataly in Westfield Place, 70 Pine Street location of Black Fox Coffee & Market will also be home to a restaurant by former Nomad executive chef James Kent, 28 Liberty Street will be the new location of Danny Meyer’ restaurant on the 60th Floor with 360-degree views, Beekman Hotel’s Fowler & Wells and Augustine, Adrienne’s Pizza Bar, Mad Dog & Beans, Harry’s Café and Steak, Delmonicos, Bobby Vans in an old bank vault, India House on One Hanover Square was the home of Hanover Bank. The name pays homage to the Dutch West India Company, the first colonizers of Manhattan, The Dead Rabbit, Trinity Place Bar & Restaurant, The Cedar, The Hideaway on old slip, VBAR, Trading Post, Blacktail on Pier A, Barbalu on Front Street.